On April 7 each year, Rwandans observe Genocide Memorial Day. This solemn observance commemorates the beginning of the Rwandan Genocide that took the lives of 20% of the country's population. 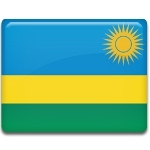 Rwanda is primarily populated by two large ethnic groups, the Tutsi and the Hutu. The relations between the two groups have always been tense. The Hutu used to be the unprivileged majority, while the Tutsi minority had all the political power. In 1959 the ethnic tensions led to the Rwandan Revolution. A new wave of confrontation began in the early 1990s. By that time, the Hutu had seized power in Rwanda. On April 6, 1994, Rwandan president Juvénal Habyarimana was killed when his airplane was shot down and crashed. His assassination sparked the notorious Rwandan Genocide. On April 7, Rwandan soldiers, police, and militia started to execute key Tutsi and moderate Hutu leaders. Hutu civilians were recruited or pressured to kill Tutsi. The genocide lasted for approximately three months. During this period, an estimated 500,000–1,000,000 Rwandans were killed, most of whom were Tutsi. The memory of the victims of the genocide is honored during an official week of mourning that starts on April 7. This day was designed as Genocide Memorial Day. It is a public holiday in Rwanda.